Striking double-flowered blooms to add something different to your garden. 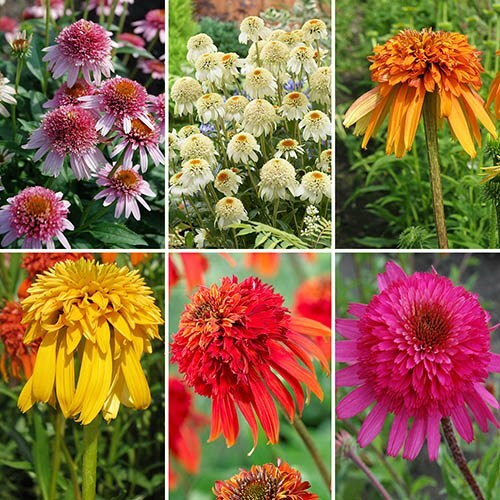 Unlike traditional seed raised kinds these innovative 'tissue culture' plants are more vigorous, colourful and with bigger, longer lasting flowers! ith their diversity of colour and form there's something for every planting scheme. As a true hardy perennial they'll reappear year after year getting bigger and stroner from summer to summer. Delivered as large 'garden ready' plants. Bold and beautiful, these gorgeous late-summer flowering Echinaceas or 'Cone-Flowers' will bring dramatic and vibrant late summer colour to your garden. Unlike traditional seed raised kinds these innovative 'tissue culture' plants are more vigorous, colourful and with bigger, longer lasting flowers! Stately and vibrant in the border, they'll blend beautifully with other herbaceous species and these unique 'doubles' in particular are also superb in large patio containers. And... with their diversity of colour and form there's something for every planting scheme. With a delicate honey like scent they make wonderful cut flowers and as true hardy perennials they'll reappear year after year getting bigger and stroner from summer to summer. Delivered as large 'garden ready' plants. Grow in a sunny spot as they love summer warmth. Plant in well drained garden soils in sunny spots - then leave alone as they dislike root disturbance.